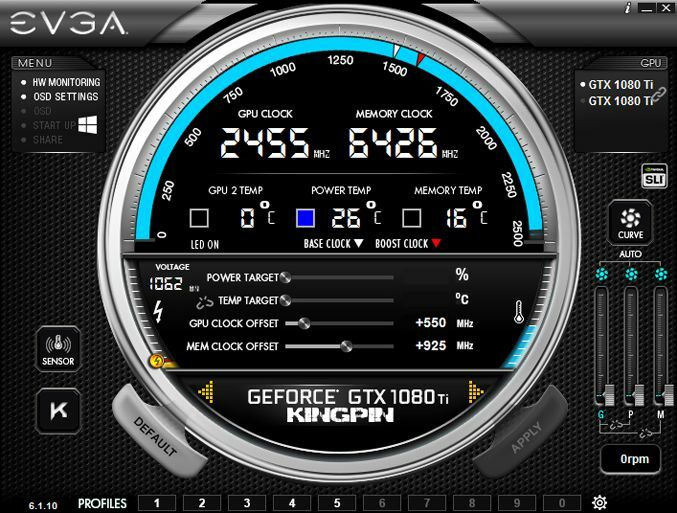 K | ngp | n did not limit itself to overclocking a single GeForce GTX 1080 Ti ", and was able to experience a duo of similar graphics solutions in 3DMark Vantage Performance, setting a world record, Corresponding to the result of 126 475 points. Both video cards were cooled with liquid nitrogen, they were overclocked to 2455/12852 MHz, and the central ten-core processor Core i9-7900X in this case was satisfied with the frequency of 5.9 GHz instead of yesterday's 6.0 GHz. This example proves that enthusiasts have not lost interest in SLI links, but on the whole market they hardly define anything from the point of view of the demand for this technology. 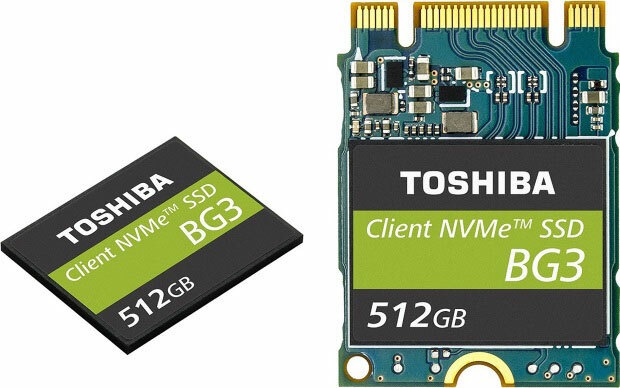 The latest achievement of Toshiba in the field of flash memory was the mass production of the world's most advanced 64-layer 3D NAND TLC (in the definition of the company - BiCS TLC) with a capacity of 512 Gbit. Packing several such crystals in one case allows you to produce a capacitive single-case SSD. In other words, to produce very small in size solid-state drives for compact computing. So, in the new series of budget BG3 SS3, the company introduced a number of models in the form factors M.2 1620 (pictured left) and M.2 2230 (pictured right). In the form factor M.2 1620 it's just one chip with a contact group BGA for wiring to the board - models with a capacity of 128 GB and 256 GB have a height of 1.35 mm, and models with a capacity of 512 GB of height 1.5 mm. In the form factor M.2 2230 are presented the same capacity, but with the possibility of self-installation by users in the scrap M.2. The length of the drive is only 3 cm. In both cases, the chip includes a memory controller supporting the NVMe 1.2.1 protocol and the PCIe 3.0 x2 interface. The drive does not have built-in DRAM memory. Buffering is carried out by allocating space in the system memory (Host Memory Buffer, HMB). It is also possible to work in the mode of transferring a TLC cell into a pseudo SLC. This will definitely speed up the work of the drives series , although the stated steady speeds are so good for a single-case SSD. It is reported that in the read mode the speed reaches 1520 MB / s, and in the write mode - 840 MB / s.
Toshiba BG3 SSD series is designed for budgetary use. The price of the issue is not reported. The drives will be supplied to OEMs via OEM channels. There is an opinion that the price of SSD of this series will be close to the cost of SATA HDD drives of similar capacity. If necessary, the new series models support the TCG Opal Version 2.01 data protection technology. Demonstration of the development will be held August 8 at the Flash Memory Summit 2017. There is no need to remind our readers that the relationship between Western Digital Corporation and Toshiba remains tense. The companies own a joint venture to produce memory, a share in which WDC inherited after the purchase of SanDisk assets. In this case, Toshiba expects to sell the business of memory, and Western Digital is trying to be among the first bidders for the purchase. The parties use not completely harmless means for each other to achieve their goals, and therefore nothing is solved with the sale of assets, and the conflict has not yet been eliminated. Toshiba only recently admitted that it is ready to return WDC representatives' access to the databases of the joint venture, if the court requests so. As reported by Reuters , the Japanese side is now ready to single-handedly finance the purchase of equipment for the new production line Fab 6, which will be launched by the middle of next year, and will first master the release of NAND-memory class BiCS, and then participate in the production of memory type 3D NAND, In the range of products Toshiba intends to bring up to 90% by 2019. Toshiba will have to increase the investment by about 8.3%, so that single investment does not look like an "unbearable burden". In addition, WDC claims that it is ready to seek the right to participate in financing the expansion of the Fab 6 in the future. Yes, and Toshiba itself recognizes that it is ready for negotiations with American partners on this topic. As the Bloomberg edition notes, in Japan with the preserved tradition of "lifelong hiring" Toyota decided on an unprecedented audacity: it began posting campaign posters in the vicinity of the transport highways of Tokyo suburb , which is famous for the highest concentration of specialists in the field of high technologies. I must say that the demand for "IT specialists" in Japan is too high to meet the needs of all employers, so Toyota has to act in a similar way. Employees of NEC and Toshiba, in particular, are considered one of the most likely candidates . Traced in Toyota's actions and the desire to save money. The software developer in Japan receives about half as much as his colleague in the so-called Silicon Valley. And Toyota's spending on development is steadily growing, albeit at several percent per year, so the company does not want to give up the opportunity to save. Interestingly, in the research center of Toyota, which is engaged in the development of electric vehicles, while only four people work. Until recently, the company did not attach much importance to the development of vehicles on "pure electric traction", preferring hybrids and cars with hydrogen fuel cells. The corporation remains one of the few companies in Japan, showing a high rate of operating profit. Before the leadership of Toyota is a difficult task: on the one hand, do not drop financial performance, on the other hand - not to lag behind competitors in the scientific and technical sphere.